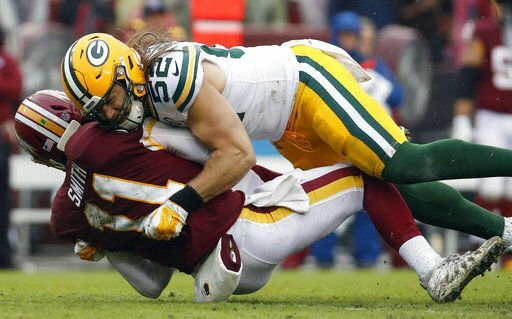 Green Bay Packers linebacker Clay Matthews sacks Washington Redskins quarterback Alex Smith on a third-quarter play that resulted in a roughing-the-passer penalty in Washington's 31-17 win on Sunday, Sept. 23, 2018 in Landover, Md. Packers linebacker Clay Matthews reacts to his roughing-the-paser penalty after tackling Redskins quarterback Alex Smith in the third quarter. It was the third time Matthews has been whistled for the call this season. LANDOVER, Md. — Green Bay Packers linebacker Clay Matthews does not understand why he was flagged — yet again — for roughing the passer, this time while sacking Washington's Alex Smith on Sunday. Matthews think it's an indication that the NFL is "getting soft." Even Smith wasn't quite sure about the call that came late in the third quarter of Washington's 31-17 victory. Neither were other players —the coaches —both teams. Matthews broke free into the backfield, grabbed Smith with both arms and took down the QB in a seemingly straightforward manner. "That's a football play. I hit him from the front, got my head across, wrapped up. I've never heard of anybody tackling somebody without any hands. When he gives himself up as soon as you hit him, your body weight is going to go on him." "I had judged that the defender landed on the quarterback, when he was tackling him, with most or all of his body weight, and that's not allowed," referee Craig Wrolstad said, according to a pool report. "That was basically my key - that he landed on him with most or all of his body weight." Matthews immediately put his arms up and slapped himself in the helmet as the flag was thrown. Packers coach Mike McCarthy threw down a play-calling sheet and argued with two officials about the call, yelling while chasing one along the sideline. "I think Clay did exactly what he's supposed to do there," McCarthy said. "He hit him with his shoulder. He was coming full speed off of a block. He braced himself. So I was fine with what Clay did." In Green Bay's 29-29 tie against the Minnesota Vikings last week, a potentially win-sealing interception for the Packers was wiped out by a roughing call on Matthews when he hit Kirk Cousins. "Unfortunately, this league is going in a direction that a lot of people don't like. I think they're getting soft. The only thing hard about this league is the fines they levy down on guys like me that play the game hard," said Matthews, who actually was not docked pay for that hit on Cousins. "Maybe now pass rushers, guys getting after the quarterback, you'll just have to attack the ball." Smith's take on the hit he took from Matthews? "I'm glad I don't play defense. ... They can't hit us in the head and can't hit us in the knees when we're in the pocket. It's tough. I felt like he was playing football. He's played a long time. Hit me right in the strike zone," Smith said. "That's the new rule they put in, though, with these guys finishing quarterbacks to the ground." The rule preventing defenders from landing on the QB has been around since 1995, but the league's competition committee made it a point of emphasis this year. More than 30 roughing-the-passer penalties were called in this season's first two weeks. "Every week," Redskins coach Jay Gruden said, "there seems to be another one that's a little bit questionable." With a heavy sigh, Matthews said: "Nine years, I've been doing it one way in the NFL, successfully, and now it just seems as if that way doesn't work anymore. And that's frustrating." "Oh, my gosh. Look, I'm glad it was for us, but then when I looked at it, I was like: What else do you want the man to do? Seriously, what else do you want the man to do?" Redskins cornerback Josh Norman said. "When I saw it, it was not malicious, ill intent. It was just a nice form tackle. ... I'm lost by it. I'm pretty sure (Matthews) is frustrated and he has a point." The Green Bay Packers lost to the Washington Redskins, 31-17, on Sunday at FedEx Field in Landover, Maryland. Green Bay's 31-17 loss to Washington on Sunday at rain-soaked FedEx Field revealed every performance and personnel wart the Packers have.